Incredible custom-built home in the exclusive Chautauqua Escapes subdivision on beautiful Lake Chautauqua. Located just a few steps away from the lake access, docks, tennis courts, community pool, petting zoo and all the amenities Camp Chautauqua has to offer! The open floor plan offers a two-story foyer, large-bright living room with spectacular views of lake, wood burn fireplace and built-ins. A fully applianced kitchen w/ island & breakfast bar leads to an enclosed screened porch, a perfect spot for relaxation. Convenient 1st floor laundry/pantry area. Second floor w/master bedroom suite & additional lake views! Lower level is a walk-out w/family room, 2 beds, full bath and storage/utility room. First flr and lower level have full decks off the rear. Hardwoods and ceramic floors throughout, H/E furnace, central air, fire pit, too much to mention! 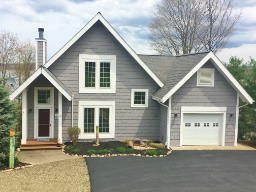 Centrally located just minutes to Chautauqua Institution and Bemus Point. Directions To Property: Rt 394 To Magnolia. Right Into Chautauqua Escapes. Left Onto Escapes Drive, House Is On Overlook Drive. Follow Signs To Overlook Drive, Veer To Left When Entering Overlook.